MyGreenSoapbox: Coffee Grounds for Celebration! How many of you are sitting down reading this right now with a cup of coffee in your hand? I know I am. 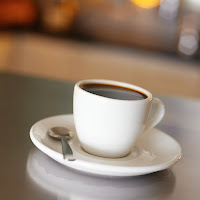 I enjoy a good hot steaming cup of Dr Red's Olevine Coffee which is a nice Arabica Coffee with red grape and olive leaf extract added for extra health benefits. Yum! I put a tablespoon of the coffee in my plunger and fill it up with boiling water and let it stand for a couple of minutes. My next question. What do you do with your coffee grinds once you have finished enjoying your cuppa? If you are someone who usually throws them away, you might want to stop and reconsider because coffee grinds are actually very useful to recycle. I personally use coffee grounds in a few of my beauty routines and not only have great skin to show for it but it also saves me heaps of money and sits well with my philosophy of trying not to waste anything. I have mature sensitive skin and have not had any problems using coffee grounds. Coffee grounds are a good source of antioxidants, magnesium and Vitamin E as well as having antibacterial properties, all of which your skin will appreciate and benefit from. Here are a few ways I use them in my beauty routine. I mix a teaspoon of sea salt crystals with coffee grounds and use that as an all over body scrub when I have a shower. Leaves you feeling invigorated and your skin feels really soft and smooth afterwards as well. I add a tablespoon of olive oil, 1 teaspoon of sea salt to coffee grounds and apply it to my face, rubbing in an upward circular motion. Rinse off with warm water. I have found that it reduces the size of my pores, leaves my skin glowing and soft and it also seems to tighten and tone it as well. I mix 2 tablespoons of plain yoghurt, 1 tablespoon of organic honey and 1 teaspoon of coffee grounds together until they are well blended. I smooth this on my skin avoiding the eye area and leave it on for five minutes. I rinse it off and pat dry. The skins feels lovely and smooth. There are many more uses for coffee grounds - insect repellant, compost for the garden, dyes and more. If you have any tips for using coffee grounds please feel free to share them. Wow Sonja, i would never have thought to use coffee grinds for face care - no wonder you look so stunning! I have used them in the compost however ... some new things to try... yay! I have a heap saved ready to go around seeds and seedlings, as I have heard that snails don't like them. Also good for a body scrub, too, in the shower. Thanks for your lovely compliment Char (blush). Glad you enjoyed the article. Stella I am going to try your idea about the snails! Thanks for the tip.